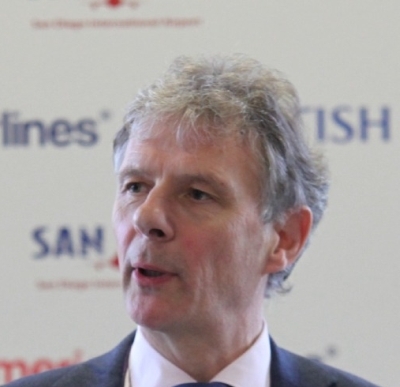 Keith Williams has been the Chief Executive Officer of British Airways since January 2011 a company he joined in 1998. As Chief Financial Officer of BA over the previous five years, Mr Williams played a leading part in the airline’s achievement of a record operating margin in 2007, before steering it through the worst recession in its history and masterminding a solution to its long-standing pensions deficit. A chartered accountant (and graduate of Liverpool University) he previously worked for a range of major corporations including Arthur Anderson, Reckitt and Coleman, Apple Computers and Boots plc. He serves as Non-Executive Director of Transport for London. The great thing about the start of January, like the two headed Roman God it was named after, is that you can always spend a little bit of time looking forwards and backwards. And for me January also marks the end of my first year as British Airways chief executive and the start of an exciting second. Looking back, 2011 has been a year of focusing with absolute clarity on our objective of putting customers at the heart of everything we do. One of the highlights was undoubtedly the launch of our first major brand campaign for more than ten years, and judging from my inbox our TV advertising, which captures the very heart of British Airways, has certainly made an impact. 2012 will see us develop the brand campaign further as we build on the successful first few months. The year will also see further improvements in what customers experience onboard as we continue with our £5billion investment plans. Our engineering teams will be particularly busy this year as we have more than 30 long haul aircraft being either refitted with new cabins from back to front or refreshed with a greatly improved look and feel. We also welcome the delivery of two new Boeing 777-300 ER aircraft, which will take that fleet up to six. These aircraft continue to receive excellent reviews from our customers as well as paving the way for our 12 new Airbus A380s and 24 new Boeing 787 Dreamliners which begin to join the fleet in 2013. We have also been strengthening our global network in the past 12 months, launching five new routes – to San Diego, Marrakech, San Juan, Tokyo Haneda and direct flights to Buenos Aires. I hope that we will be able to add some more cities to this list during the coming months. The past year has also seen us developing our joint transatlantic business with American Airlines and Iberia, which now features flights from Heathrow to New York JFK more or less every hour from 11:00 to 20:00. The news last month that American Airlines, has begun the Chapter 11 process, is I believe an opportunity for our joint business to become stronger still, once American emerges on the other side, as so many of its rivals have already done. Consolidation and setting up joint business arrangements will shape much of the aviation landscape for many years to come. The over capacity and associated inefficiencies across the industry need to be addressed more than ever in light of the prevailing economic headwinds. I have no doubt that British Airways’ owner International Airlines Group will be a leading figure in that consolidation and just before Christmas it signed a binding agreement with Lufthansa to purchase bmi, subject to all the necessary regulatory approvals. Buying bmi’s mainline business gives IAG a unique opportunity to grow at Heathrow. It will also mean IAG can use its slot portfolio more efficiently and it also provides the option to launch new long haul routes to key trading nations while supporting a broad domestic and short haul network. Customers will benefit from access to new destinations, more convenient schedules, enhanced frequent flyer benefits and greater investment than had been possible for loss-making bmi. The deal requires regulatory clearance and I hope there will be more news from IAG in the months ahead. Taxation is another issue which will be in the headlines during 2012, just as it was in 2011. The UK government talks about creating the conditions for jobs and growth – but I am sorry to say the reality is the opposite. Its tax policy, which is uniquely hostile to aviation, is costing potential jobs and growth at British Airways. The rises in Air Passenger Duty, which will cost our customers over £350million next year, have left us with no alternative but to cut back on our planned 2012 recruitment from 800 new jobs to nearer 400. Many of these opportunities would have been for young people. At a time of high unemployment for new graduates and school-leavers, it is deeply regrettable that these additional tax increases have propelled us into this decision. To end on a happier note, as the official airline partner of the London 2012 Olympic and Paralympic Games, our teams across the airline are particularly looking forward to working together in welcoming the world to our home city next summer. This is a great opportunity for the whole of the UK to show the world, the very best of what our country has to offer. Whatever you are doing, or wherever you are flying, I wish you all a successful 2012 and we look forward to serving and caring for many of you on our flights in the year ahead.